Slavske, guest house "At Demian’s"
Private house “At Demian’s” is located in Slavske settlement in Lviv oblast. 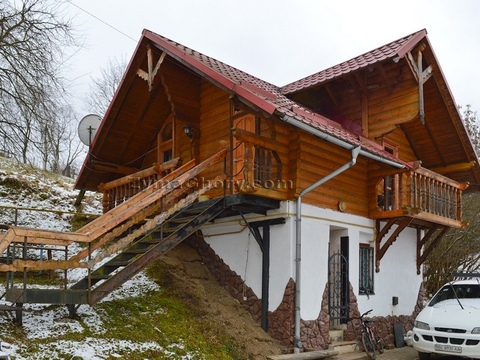 It is about 250 meters to the chair lift from this house and is about 300 meters to the center of the settlement. Guests are accommodated in a three-storey building for 14 people and in a separate cottage for 4 people. There is a summer house, a pond with fish and a grill on the territory. There is also a parking. Cold and hot water is 24 hours. • on the 3 floor: a dining room, 2 triple rooms, 1 double room. • bathroom in the room (toilet, wash basin, shower) is on the 3 floor. • 2 double rooms: double bed, balcony, and bathroom. Two meals a day are included. There is a possibility of self-cooking in the well-equipped kitchen. • the use of a hair dryer, an iron and a grill. • discounts for groups of tourists and for long stay. We invite to rest in “At Demian’s” private house! Slavskoe, guest house "At Demian's"
Room in the cottage Hall, two double room: double bed, balcony, TV, bath-room. Room in the house Double bed or 2 single beds, sofa bed, TV, wardrobe, bathroom.